Water and tea are the most widely consumed beverages in the world. Tea has been consumed, enjoyed, and celebrated in China for centuries, not only for its taste but for its positive biological health effects. 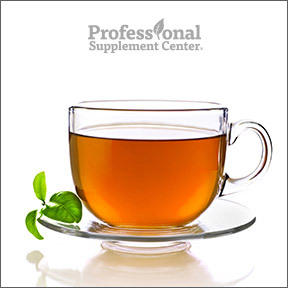 Anyone who has ever wondered why tea may be offered during stressful situations may be surprised to learn that tea contains a unique amino acid called L-theanine. Found only in the tea plant and certain mushrooms, L-theanine has been shown to promote relaxation without inducing drowsiness. All types of tea, brewed from the leaves of the Camellia sinensis plant contain some concentration of L-theanine, including black tea, green tea and oolong tea. Since L-theanine was identified in the 1950’s, it has been utilized to naturally treat anxiety and stress and continues to be studied as a cognitive enhancer, or nootropic. L-theanine is thought to work synergistically with caffeine, bolstering the positive mind-energizing effects, while reducing the negative effects on blood pressure and heart rate. L-theanine is believed to counter the stimulating effects of caffeine by increasing alpha brain wave activity. Alpha activity is known to play an important role in critical aspects of attention and is associated with a state of relaxation, along with mental alertness. In L-theanine studies, alpha brain wave patterns were similar to those seen during meditation, where the body is relaxed and the mind is calm, similar to a state of wakeful relaxation. Structurally, L-theanine closely resembles glutamic acid or glutamate, an excitatory neurotransmitter. However, in order to act as a neurotransmitter, glutamate must attach to specific receptors in the brain. L-theanine, which has been shown to have the ability to cross the blood brain barrier, promotes relaxation by preventing glutamate from binding to these receptors. By blocking the binding of glutamate to receptors, L-Theanine aids in stress reduction, and may also improve alertness, concentration and attention span, all without sedative effects. Because of its ability to cross the blood brain barrier, L-theanine is believed to play a role in regulating other neurotransmitters, including GABA, an inhibitory neurotransmitter. L-theanine is thought to have a positive effect on dopamine and serotonin production as well, which may result in increased focus and creativity, improved memory and enhanced learning. Additional potential benefits include, anxiety relief, gentle lowering of mildly elevated blood pressure and, in some cases, improved sleep. Please be advised L-theanine should be used under the guidance of a healthcare practitioner if you are undergoing chemotherapy or are taking cholesterol lowering or antihypertensive medications. L- Theanine by Pure Encapsulations – Each vegetable capsule offers 200 mg of SunTheanine® L-Theanine in support of healthy neurotransmitter function and the easing of occasional nervous tension and irritability. Gluten, soy and dairy free, Non-GMO vegetarian formulation. L- Theanine by NuMedica – Each capsule contains 200 mg of L-Theanine as SunTheanine®, pure Japanese L-Theanine, in support of relaxation and stress relief. Gluten, soy and dairy free, vegetarian formulation. L-Theanine by Nutritional Frontiers – This gluten free, vegetarian formula provides 200 mg of SunTheanine™ L-theanine in support of stress management, relaxation and reduced irritability. L-Theanine 200 mg by Vital Nutrients – One serving provides 200 mg of L-theanine in support of normal stress levels, relaxation and a sense of wellbeing, as well as reduced nervous tension and irritability. This entry was posted in Home and tagged L- Theanine by NuMedica, L-Theanine 200 mg by Vital Nutrients, L-Theanine by Nutritional Frontiers, L-Theanine by Pure Encapsulations L- Theanine by Pure Encapsulations, Need to Chill Out? L-Theanine Can Help, Professional Supplement Center, Vitamins and supplements, www.professionalsupplementcenter.com. Bookmark the permalink.